In today’s world, a couple thousand years removed from the Jewish, first-century days of the New Testament, I believe we have lost the shock value of what we call ‘the Good Samaritan parable’. So I want to re-tell the account, but in a way that would cause as much shock today as it would have for those listening in Jesus’ day. This entry was tagged Good Samaritan, Muslims, parable. Bookmark the permalink. God has always been about getting his word to normal people, like you and I. 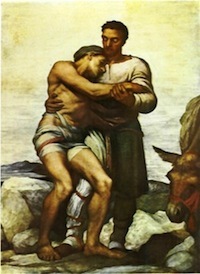 The ‘good Samaritan’ version must be reshaped in a way that speaks to the bride today. I think this works a lot better today and Jesus would have felt very good telling it this way today. I disagree, not in the idea that the so-called “normal” person should not read this great parable, but that they should read it as Jesus meant, historically and exegetically! This parable does not teach “good works”, as God’s “mercy”, grace and Gospel! Yes, read it in its context first. Then help us think what it would look like today. I’m pretty sure God is very interested in that. And I think we tend to forget Jesus’ own words in places like Matt 5:16 – In the same way, let your light shine before others, that they may see your good deeds and glorify your Father in heaven. I’m not talking about something Luther and the Reformation wanted to combat against – good works earning us God’s grace. I’m talking about walking out loving our neighbour – the point of the storied parable. My point Scott, is that the “Gospel” and certainly the “kerygma” (message) is behind the Gospel Parables, and certainly in St. Luke! We must walk very carefully here! Note Roman Catholicism likes to step in here and create a “works” righteousness of merit for the believer! This is a big mistake, biblically & theologically. Are you dealing with things in 2012 or from 4 or 5 decades ago? Let’s lay aside this RC polarisation of things. No one, especially Christ, is teaching a “works righteousness”. Here is the king with the evangel telling us how to live and how living in accordance with his rule will actually draw people in. Astounding! Scott: I know you think I am just an old Churchman and Reformed, but you did not note my first portion of my last post (the Gospel message, i.e. the kerygma, itself!) The truth is that fallen man and humanity has been seeking a works-righteousness since Cain! And Roman Catholicism, though certainly presenting the proper Christ, and the Trinity of God (overall) sometimes miss the doctrine of God’s Sovereignty in the Gospel of God, and often add a works-righteousness, also. Many other Churches also do this, in many other ways, Pentecostal’s, etc. sometimes. Sorry, but true! Holiness adds nothing to salvation itself, but is a product of God’s saving grace. God is not Arminian, and certainly not Pelagian, in my theological opinion! Btw, if we turn to the doctrine of Justfication by Faith, there again we are challenged with the Gospel doctrine itself. For classic Reformation doctrine makes a distinction between Justification and Sanctification! Not a minor place for this Anglican! Indeed however, we must place faith and works in their proper place also.